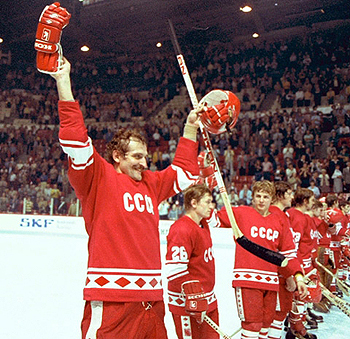 From its first appearance in an Olympic games in 1952 to its final appearance in 1988, the Soviet Union was a dominating force in the international sporting world. In 6 of the 8 Summer Olympics they competed in, the Soviet Union was at the top of the medal count. Even though the Soviet Union stopped competing in the Olympics in 1992, to this day they only trail the United States for the most Olympic medals of all time. 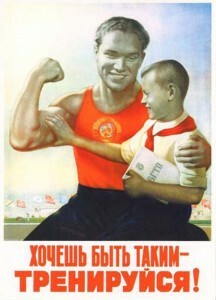 Much of the Soviet Union’s success can be attributed to the tightly controlled sports programs initiated by the government. This Research Guide will explore the external and internal impacts of the Soviet Union’s obsession with sporting success as a catalyst to their worldwide communist movement. Through this guide we will not only explore the dedicated life of a Soviet Olympic athlete but we will also discover the job-like circumstances in which sports are incorporated into a factory worker’s life. This guide will also explain the motivations behind Soviet international sporting success on the world’s grandest stage, the Olympics, and how the Soviet’s participation in the Olympics made many events far more important than just a game. The source describes how sports were incorporated into the daily lives of Soviets in order to make them more well-rounded individuals and more productive workers. Howell also believes the Soviets international success was due mostly in part to the state’s total control of Soviet athletics. Soviets were strong believers in the “triangle” theory where the more people they trained and had participate in sports, the large base of the pyramid, they would be able to produce more top level athletes to succeed in international competitions. In his paper, Washburn explores the transition the state of Soviet athletics has made leading up to their Olympic debut in the 1952 Summer games in Helsinki, Finland. Washburn contrasts “bourgeois sport” with Soviet sport by describing how Soviets have correctly implemented athletics into their culture to strengthen their political party while the bourgeois denounced sport as a method of making man “stupider than he already is”. Washburn also discusses the “spartan” attitude that the Soviet Union encourages its athletes to adopt. Many athletes are punished by the state by not having the will to win, even in the seemingly irrelevant sport of chess. Cooke’s first hand account of U.S.S.R. and the country’s obsession with sports. Cooke explains that Soviet’s go about playing sports with a “certain grimness” that makes it look as if they do not find much enjoyment in playing sports. Sports is so heavily integrated into society in many cases its is just another job. For example workers in factories are required to do exercises throughout the work day that are designed to increase their productivity. Guttmann discusses the long process of the Soviet Union gaining membership to the IOC, International Olympic Committee and competing in the Olympics. The Olympics provided the Soviet Union with the grandest stage to showcase its athletes to the world and it also provided foreign countries with an intimate look into the closed society. He also describes how both the United States and the Soviet Union used Olympic boycotts as political weapons in the Cold War. In PBS’s interview with Dr. Lev Markov, a doctor specializing in sports medicine who worked in the Soviet Union, Markov releases inside information about Soviet athletes and their training practices. A big issue in the interview is the association of the Soviet’s international success with the speculation that many of their athletes took performance enhancing drugs. In Peter Alfano’s 1989 article, he writes about how the Soviet Union is allowing its athletes to compete in foreign lands for the first time under Gorbachev’s leadership. The articles reports the various motives behind the Soviet Union’s decision which includes “obtaining currency for their struggling economy” and possibly improve relations with other countries during the perestroika period. Burnton explains the political importance of the “Blood in the Water” water polo match between Hungary and the Soviet Union in the 1952 Olympic games in Helsinki, Finland. The Soviet Union, jealous of Hungary’s past success in international water polo, tried to take advantage of their occupation of Hungary at the time by copying and replicating the water polo strategies of the Hungarian team. Hungary still dominated the heated match and in frustration a Soviet player, Valentin Prokopov struck a Hungarian player, Ervin Zádor, causing him to bleed excessively from the face. Pictures of Zádor’s bloody face were included in newspapers around the world. In this article Ingle describes the controversial 1972 Olympic basketball final in which the Soviet Union handed the United States its first Olympic basketball loss. The vast differences between the two nations could be seen through the demographics of its players. The United States featured an array of young African-American future professional basketball stars while the Soviets had a group of older white men who had been playing with each other for a number of years. The controversial ending to the game only increased tensions between the two nations. In his column, Eskenazi discusses the importance of the United States upset victory over the mighty Soviet Union hockey team during the 1980 Winter Olympics in Lake Placid. This victory helped ignite confidence in the American people especially during a time where the Soviets seemed to an edge in the Cold War. Eskenazi believed this defeat was a metaphorical “beginning of the end” for the Soviet Union especially since they were fighting in Afghanistan at the time. This poster depicts the successful Soviet athlete as a super hero-like figure. By placing athletes on an elite pedestal, the Soviet Union hoped to influence younger generations to train harder and continue to make the country proud by excelling in athletics. 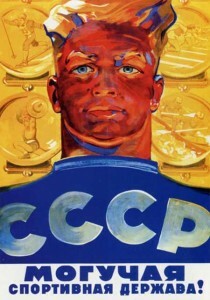 In this poster a Soviet athlete is shaped like the Olympic torch and surrounded with gold medals from various sports. This propaganda poster suggests that the Soviets are so dominant in the world of sports they essentially are the Olympics.